Exercising may get harder as we get older but it also becomes more important. We have some easy exercises you can do to keep seniors health and active even in winter. Cold weather is coming and that usually means joint discomfort, especially for seniors. Unfortunately as we grow older, the mindset kicks in that we can't do much anymore. Whether it's osteoporosis or other health concerns, growing up has a lot of people tuning out of exercise. This is a problem for a number of reasons. Not only does exercise help prevent a number of ailments we don't want when we're older but it can actually help deal with some of them too. 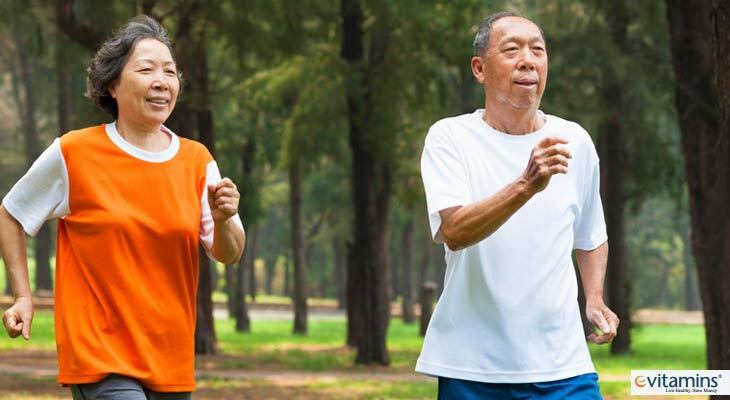 According to a study in Population Health Management, exercise showed improved quality of life and lowered impairments for seniors who participated in physical activity. It's important to note that not only were the scores for physical well being higher but emotional health was too. And that's not something everyone thinks about. With the focus being on young minds developing mental illness, senior dementia is often left until it's too late. We've written about it before but to recap, exercise may play a role in delaying the onset of Alzheimer's and dementia. Exercise improves brain function and memory. For seniors who find themselves forgetting where they put things or those suffering from dementia, exercise is a great way to increase mental awareness. Some of those seem a lot more intimidating than they actually are. Weight training doesn't mean lifting dumbbells at the gym, it can be as simple as lifting a water bottle with your routine. And resistance training means pushing against something that makes the exercise harder, like running in water (which is great for your joints). While you may have had nice weather to walk or use the pool, colder weather means you have an excuse to stay inside and be careful of slick ice. But you don't have to stay inactive this winter. We've got simple exercises you can preform anywhere and a few minutes a day can greatly impact your health, balance and frame of mind. What it does: Gets the blood flowing, prevents dizziness upon standing. When to do it: Getting out of bed or after sitting for a long time. How: Sit on the edge of the bed or in a chair with your back tall and straight. Point and flex your feet 5 times. Optional: Circle your ankle for better foot motion and to help with swelling. What it does: Builds strength, balance and coordination. How: Stand with your feet together and hands on hips. Lift your right foot and step over to the side as if over something. Repeat with other leg.Do ten times. Move slowly to keep your balance. Pick up your knees. What it does: Increase range of motion for your hips and improves use of function for stepping out of a car or the bath. How: Sit in a chair with your back straight. Place your right ankle on your left knee. Gently press down on the knee until you feel the stretch. Hold for 10 to 20 seconds. Repeat with left leg. What it does: Improves coordination and balance. When to do it: Whenever you get something off the floor or from a high shelf. How: Place one foot behind the other and reach down to pick something off the floor. This will help you keep your balance. Bend both knees as you bend down. Place one foot behind the other and reach high to place something on a shelf. When to do it: Whenever you feel like it! How: Put on some music or go without it, pick ten dance moves and go for it! Exercise should be fun and there's always a reason to dance! For more workouts or if you have concerns about physical activity, ask your doctor or physical therapist about other moves you can try. Even a stroll around the mall with the grandchildren can add a lot of benefit to your life. Tell us how you're staying in shape this winter on our Facebook, Twitter or Instagram pages. Check back next week for more health tips and news on how to continue to live well! Keep your joints healthy naturally with this blend of herbs, enzymes and antioxidants. You'll need strong bones to keep up your exercises to try this high-quality calcium supplement with extra nutrients designed to keep bones strong. Reach of this when you feel the aches coming on. It will keep you on your feet and back straighter by fighting pain with all-natural ingredients.